Cafe Horizonte is awating you in building C, 4 on the Coblitzallee campus. Top floor (OG), Entrance C.
A great place for a break with a view and a fresh "sustainably produced" coffee from Jacobs. 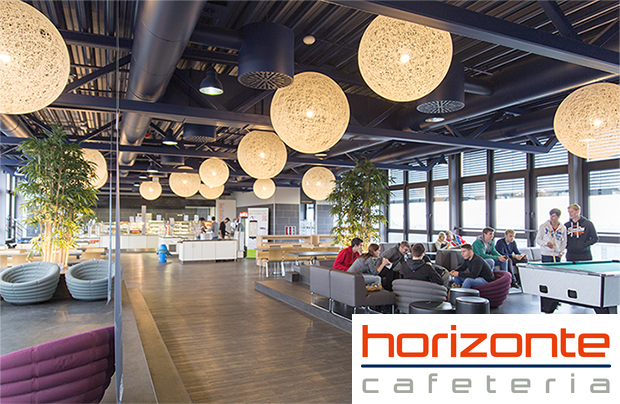 The MorgenLounge of the MANNHEIMER MORGEN can also be found in Cafe Horizonte. Sit, read, and relax- you can read the MANNHEIMER MORGEN everyday here. And if you would like to have the MANNHEIMER MORGEN delivered to your house then try the student subscription out. Large variety of cakes, snacks, and cold drinks.